Yesterday was the monthly Creative Fibres meeting; it was a workshop day: "Make a Book" - all about book binding. My Father always wanted to have a go at this but was put off when he read about it, as it implied you needed a lot of specialised equipment. I guess, in a way, you do, othewise you have to make compromises, and stick (no pun intended) with very simple books. Anyway, Chrisy and Diana put together a great workshop for us, during which we all made a simple book, (my finished book on the right). They do not normally teach crafts to hobbyists, but run a business [Bound to be Beautiful] as specialist book binders. At the end of the workshop they talked about more complex book construction methods, and we had a chance to look at the lovely books made or repaired by Chrisy and Diana. Here is the sequence of the day. Much of what we did was concentrating on keeping glue off the work - or at least off the parts where it was not intended to go! Scroll through, and click on the preview image to see it in the viewing pane. Folding and cutting the paper to make the pages. 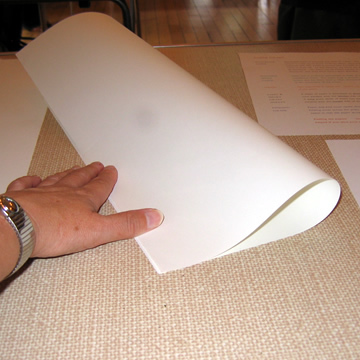 Paper is cut with a smooth bladed knife; the final fold is not cut. A bradawl or heavy needle is used to make holes before sewing together the eight folded pages. The pages are sewn with two outer (thicker) coloured end papers, and a strip of "fraynot". Finishing the sewing, with a knot inside, and the ends neatly frayed. Trimming the edges with a scalpel. Attaching the mill board book covers with a coloured buckram spine; the spine is carefully spaced to match the thickness of the pages, using a spacer. Pasting the decorative coloured paper onto the book cover. Weighting the book to allow the glue to set; this is done throughout the procedures. Pasting the end papers to set the pages into the covers. Closing the book onto the sticky end papers. Nipping the book for 10 seconds in a press. Examples of finished books from "Bound to be Beautiful". I am moderately enthused by all this, and would like to do more. In my usual fashion, though, I would like to craft my way through stuff I already have, whereas it's clear that to get a really good result you need to use the right materials. Maybe I'm not quite so interested in a really good result as such, but at the same time I feel I can't dismiss the many years of studying and experience that people like Chrisy and Diana have spent to become masters. Still - experimentation and innovation is everything for the amateur. Hmm, well at the moment the boys get me to make them books by stapling printer paper with construction paper covers. Perhaps you could teach them bookbinding so their own books would look so much nicer?